Jerry Smothers of Pentaluma, California., Writes, I just received quite a shock as my car reached 96,000 kilometres and the engine needed to have the timing belt replaced. I had no idea these things cost this much. I didn’t have to do this on my previous car. My mechanic told me it is really important to change the belt, as it can cause severe engine damage if it were to strip teeth or break. Why was this never a problem on my other cars? Why would an engine be built so that it self-destructs like this? Answer: It sounds as if this might be your first overhead cam engine or one that uses a belt rather than a chain to drive the camshaft. Automotive engines down through the years (with the exception of the rotary) have driven the camshaft with; either gears, a chain or a rubber belt. Linking the crankshaft and camshaft together with gears provides the most accurate valve timing, but this isn’t feasible with an overhead camshaft due to the substantial distance between the shafts. Chain-driven camshafts work well but they require a lubricated and sealed environment, cost more, are a bit noisy and are prone to chain stretch. 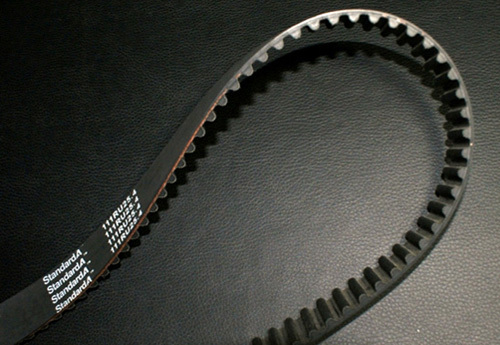 A cogged timing belt constructed of high-temperature neoprene or highly saturated nitrile rubber – containing amazingly strong fibreglass cords – is the most common cam drive method that is in use today. Lighter, quieter and more easily replaced than a chain, timing belts do an excellent job, although they require replacement at a conservative mileage. Why 96,000 km’s and not while the next owner maintains the car? Many modern engines are of interference (also called non-freewheeling) design. This means the pistons and valves will collide if the correct rotational relationship between the cam and crankshafts is not maintained. This is the price we pay for engine performance and is a function of combustion chamber shape, valve placement and valve lift. A timing belt free of oil contamination may well last longer than the specified replacement interval, but the risk of an expensive valve collision makes timely belt replacement cheap by comparison. Which engines are of interference design? It’s safest to assume one’s engine is in this category unless manufacturer information or a look in the Gates (Rubber Co.) timing belt book say, otherwise. A freewheeling engine will simply quit running if the timing belt slips or breaks. When renewing a timing belt, many shops also recommend replacement of the water pump. On most engines, the water pump pulley is driven by the timing belt and, should the water pump seize or come apart, belt failure or skipping will occur, crashing the valves of an interference engine. Frankly, this is a long shot, but since the pump is easily accessed while the timing cover and belt are removed and water pumps have a finite lifespan, most would agree that it is money well spent. Also, a leaking crankshaft or camshaft oil seal should be renewed, as oil contamination of the belt will lead to premature failure.